The British National Party has so far failed to gain significant numbers of seats in council elections, but has won increased support in some areas. It has gained record votes in the Welsh assembly elections and won increased support in Windsor and Maidenhead. But it failed to add to its tally of four councillors in Sandwell, in the West Midlands, and saw its seats in Burnley reduced from seven to four. It fielded 750 candidates in a bid to boost its council seats from 46 to 100. It has received large numbers of votes in Wales, coming fifth behind the major parties in some areas. They did best in north east Wales - polling 9.4% in Wrexham and 7.1% in both Alyn and Deeside and in Clwyd South. However, their share of the vote was not sufficient for the party to capture any seats in the Welsh assembly. The party's four candidates in the Royal Borough of Windsor and Maidenhead failed to win their contests, but claimed victory after gathering almost double the number of votes of their Labour Party opponents. In Burnley, the Tories overtook the BNP as they gained one seat to have six sitting councillors, making it the minority party in the newly formed council. The Lib Dems increased their seats from 17 to 18 and Labour gained another seat to win 17 wards, meaning no party gained overall control. Matthew Tait, who managed 336 votes for the BNP in Clewer North, said he was not expecting things to "happen overnight". "We are not disappointed, we came from nothing and we have not come last," he said. "We'll be back in four years time and we will stand again." However, in Sandwell in the West Midlands, Labour was celebrating seeing off the BNP challenge. The party failed to add to the four seats it already holds on the metropolitan borough council as had been predicted. Deputy BNP leader Simon Smith said: "It's disappointing, but we'll be back next year." 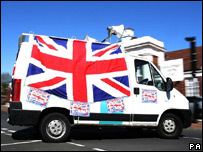 The BNP did win both Hugglescote and Whitick - the first seats to be won by the party in Leicestershire. The party lost its council member on Broxbourne Borough Council in Hertfordshire as the Tories increased their hold. Before the election, BNP leader Nick Griffin said disaffection with government had been helping his party on the doorstep. It was benefiting from the "kick Labour effect" and picking up votes from right-wing Conservative supporters disaffected with David Cameron. The party had expected gains in Stoke-on-Trent where its presence rose from five to seven councillors and in Staffordshire, where one candidate was voted onto the council, but in Thurrock it did not win any seats.